Despite the enormous publicity for Glencore’s initial public offering (IPO) on the London Stock Exchange this month, and participation in the underwriting and book-running of the Russian state savings bank Sberbank, the massive Glencore prospectus says almost nothing about the trading company’s Russian business. And on the key question grain traders have been discussing for months – how many billions of dollars did Glencore lose last year after the Kremlin imposed an embargo on grain exports? – Glencore’s documents say nothing at all. In part, Glencore’s disclosures have been miscounted — badly so. Three versions of the prospectus were released last week to the market. Two internet versions have been published; one was posted by the Hong Kong Stock Exchange. This is 43.1 megabytes in size, and runs to 1,566 listed pages. A slim-line version of the prospectus has also been released by the Hong Kong Stock Exchange. The London Stock Exchange posting on the internet has yet to appear at its regular place a week after Glencore announced its availability. Glencore has also distributed hard copies in two hefty volumes through the London offices of Citigroup, Morgan Stanley and Credit Suisse; reportedly these run to more than 1,600 pages. A close examination of the Hong Kong version reveals that 277 pages, just 18% of the total, comprise the conventional presentation for an IPO, including description of the company’s lines of business, debts, risks, and financial performance for the past three years. In the Hong Kong version, 1,289 pages are filled with technical reports, prepared by independent consultants, on mine projects and mineral exploration assets in Africa, South America, Kazakhstan and Russia. By and large, these assets are not revenue-producing yet. So 82% of the Glencore prospectus is irrelevant to investor and market evaluation of how Glencore’s active income-generating businesses have been going, and what risks Glencore is running that may turn their profits into losses. The financial tabulations also consolidate the group’s performance in such a way that it is impossible to see the geography of Glencore’s revenue, costs of operation, earnings, or profit. To look for the place Russia plays in Glencore’s global operations it is necessary to search the electronic version of the prospectus for Glencore’s identification of Russian names. The results are 35 mentions of United Company Rusal; zero mentions of Oleg Deripaska, Rusal’s chief executive and nominal control shareholder; 3 references to Sberbank; 12 references to Russneft, the Russian oil company; and zero references to Russian grain business. Most of the Rusal references are nominal and repetitive, identifying the fact that when Glencore sold Rusal most of its alumina refineries between 2006 and 2007, it acquired a 10.8% shareholding in the company. That was diluted to 8.75% by the Rusal share listing in Hong Kong in January of 2010. The prospectus records that almost all of Glencore’s income from dividend payments it receives from its stakes in other companies comes from Rusal; that is to say, Rusal paid Glencore $232 million in dividends in 2008 (out of a total dividend income for Glencore of $238 million that year). But when Rusal collapsed into near-insolvency in the autumn of 2008, it has been unable to pay dividends since. The prospectus leaves the fact recorded, but omits to discuss the reason. Aluminium trading revenue, one of Glencore’s most important ties to Russia, is lumped in with all of the metals Glencore trades. Thus, it is impossible to follow the impact of Rusal’s misfortunes on Glencore’s balance-sheet. The only reference to Rusal’s debts is a guarded one in the prospectus, reporting that Glencore has issued a guarantee for repayment of $113 million in Rusal borrowings through Glencore’s investment in Rusal; that seems to imply that Glencore has pledged its Rusal shares in case of a Rusal debt default. What valuation has been placed on the Glencore stake for the guarantee to the banks is not revealed. On paper, Glencore’s 8.75% stake in Rusal is worth almost $2 billion at today’s market price. Altogether, more than 90% of Glencore’s revenues come from trading commodities, not from digging them up or manufacturing them. The commodity trade portfolio is dominated by energy, principally oil and oil products. Almost two-thirds of the company’s revenues, $89.3 billion in 2010, are reported from energy trading. Metals trading accounts for 30% at $45.2 billion, and grain trading and agri-business, 7% or $10.4 billion. The prospectus does not reveal how much aluminium and alumina trading makes in the consolidated metals total. But it coyly acknowledges that half (50%) of the aluminium which Glencore sells comes from the two producers in which it holds stakes – Rusal (8.75%) and Century Aluminium (44%). The precise physical tonnage and dollar value remain Glencore secrets. Century, a US company, reports that it was loss-making in 2009, when it sold $230.9 million worth of metal to “related parties”. In 2010, it made $413.4 million in sales to the same related parties, which appear to be Glencore trading companies. Guesswork published by Vedomosti suggests that about one tonne in five of Rusal’s physical sales volume may be going to Glencore, and perhaps as much as 40% of Rusal aluminium sales revenues earned through Glencore trading operations. According to Glencore, on the basis of last year’s results it trades 6.7 million tonnes of alumina per annum, and 3.9 million tonnes of aluminium, making market shares of 38% and 22%, respectively. In 2010, Century says it sold just under 268,000 tonnes of aluminium. Rusal says that for that year it shipped 7.8 million tonnes of alumina and 4.1 million tonnes of aluminium. Allied Alumina (aka Sherwin Alumina), another Glencore affiliate operating in Texas (100% Glencore-owned), says it has production capacity for 1.7 million tonnes of different alumina grades, but there is no information on how much it produced and shipped in 2010. If Glencore has drafted a prospectus which leads readers into a black hole on the revenue line, the earnings line (Ebitda) is slightly more enlightening. There, according to the prospectus report, Glencore trades metals at a higher margin than energy products, which is indicated by the half-share grabbed by metals ($3.2 billion) in the consolidated earnings. This suggests that Rusal is paying a much higher trading premium to Glencore than it would if it traded aluminium and alumina for its own account. That premium was always regarded by the former Rusal chief executive, Alexander Bulygin, as a steal for the traders which it was his job to claw back for Rusal’s account. But the debt collapse of Rusal put a stop to that strategy, and for almost three years now, it has left Rusal both indebted to Glencore and dependent on it for its earnings. 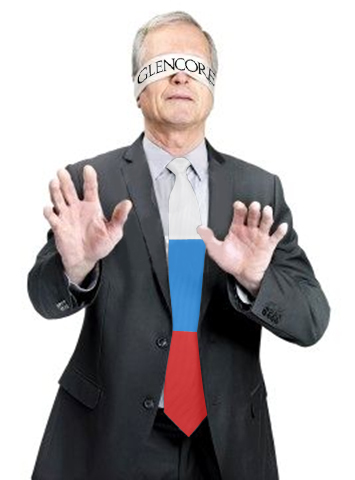 If Rusal’s year-old public shareholders, and Glencore’s brand-new public shareholders would like to know more about the division of trading profit agreed between Deripaska and Glencore’s chief executive, Ivan Glasenberg, they cannot – that deal is a secret. The references to Russian oil in the Glencore prospectus are principally about Russneft, a second-tier producer whose ownership by Mikhail Gutseriyev, has been the target of trumped-up Moscow prosecution charges and Gutseriyev’s flight to London. Glencore reports that it currently holds a stake of between 40% and 49% in Russneft and associated companies. Why there is no precision to this shareholding is not explained, and appears to reflect an unfinished conversion of what Russneft owes to Glencore into shares Glencore owns in the Russneft group, compounded by Russneft’s obligation to sell all its oil through Glencore companies. According to the prospectus, Glencore “benefits from a renewable one year off-take agreement pursuant to which Glencore is entitled to 100 percent. Of the crude oil and oil products generated by these [Russneft] assets destined for export markets.” That makes 12.9 million tonnes; in a footnote, the prospectus says this amount comprised 4% of Glencore’s aggregate oil purchases for last year. What has happened since Gutseriyev’s ouster and his subsequent return to Russneft is that Glencore says it has negotiated “a significant debt amendment and restatement.” In December last year. Russneft ended up with an enlarged loan principal of $2.1 billion, paying 9% annual interest, with a payback holiday until 2017. The negotiation appears to have added $382 million to Russneft’s obligations to Glencore, and led Glencore to putting an “impairment charge” of $336 million on its balance-sheet. According to further footnotes to the financial statements, Glencore says that $4.1 billion of Russneft debt is owed to Sberbank. Aside from Rusal, the most lucrative of these is believed to be the Russian grain companies Glencore owns or controls through its Dutch affiliate, Glencore Grain BV. The principal Russian subsidiary, International Grain Company (MKS is the Russian acronym), does not appear in the prospectus listing. Russian grain industry sources say that Glencore began trading Russian grain exports in 2005 and by 2009 was handling 2.8 million tonnes for export, about 13% of the Russian total. In proportion to the 19.8 million tonnes of grain in Glencore’s portfolio that year, Russian grain amounted to 14% — one tonne in seven worldwide. Estimates of how much revenue or profit Glencore books from its Russian operations remain secret. What is suspected is that Glencore’s grain operations are far more profitable in Russia than its operations elsewhere. What then happened last year, when Prime Minister Vladimir Putin responded to drought and fire damage to the grain harvest by ordering an embargo on grain exports, appears to have triggered a sizeable Glencore trading downturn. London sources claim that the profits booked from Russian grain sales dropped by about 20%. The Glencore Grain BV accounts suggest that revenues fell from $9.6 billion in the 2007-2008 trading year to $5.8 billion in the 2008-2009 year. There has been speculation among grain traders that Glencore had advance word of the August 2010 grain embargo and capitalized. Some sources claim Glencore managed this by advance lobbying of the government’s action, and had time to declare force majeure on many of their delivery commitments and renegotiate the terms. Moscow sources claim Glencore had no role in the embargo decision and was penalized financially by it because it was obliged to substitute lower-priced, higher-margin Rusian grain in its supply contracts with higher-priced, lower margin grain from other sources. But if the probability has changed, not to mention the impact of the post-embargo market carve-up on Glencore’s Russian volumes and earnings, you won’t learn about it from the Glencore prospectus. Not a byte in 43.5 megabytes.